A bearded man, perhaps in his thirties or forties, sits holding a book in his lap; to his left is a writing stand with an open manuscript; he holds a quill pen to his eye. 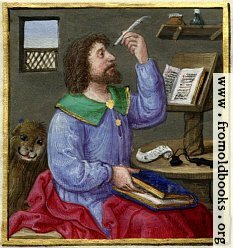 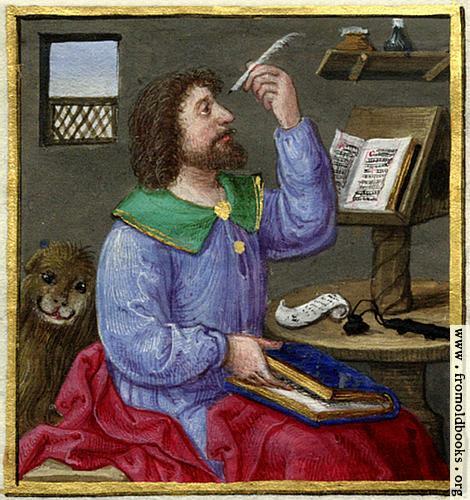 There is a lion behind him, indicating that this is Mark, the supposed author of Mark’s Gospel. Mark the Apostle, of course, would have presumably been a Palestinian, just like Jesus. This is a miniature from an illuminated Book of Hours.